A huge icy orb appeared in Fortnite, at the beginning of last week, hovering above the Polar Peaks, and many guessed it was the part of the live events leading up to Season 8. They were right. 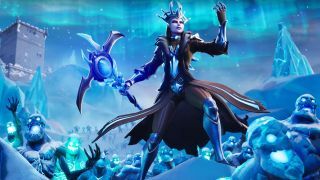 On Friday afternoon, the ice orb transformed into a large clock and exploded shortly after, allowing the Ice King to cover the entire map with snow, transforming the predominantly green playground of Fortnite into a Winter Wonderland. Well, a Winter Wonderland with ice zombies. Not content with transforming the entire map, the Ice King has also been busy spawning a new type of zombie, aptly named 'Ice Fiends.' These icy imbeciles can be found gathered in various locations around the map and defeating them will count towards Ice Storm Challenges which, once completed will reward you with a Winter-themed glider as well as a cosmetic item. The ice orb shenanigans are reminiscent of Kevin, the mysterious cube who spent weeks in the skies of Fortnite, before pulling players into a rift and transforming part of the map. A new item called the Sneaky Snowman was apparently teased with an in-game message over the weekend too—so expect that to hit the game soon. If you haven't had a chance to jump into Fortnite this weekend, it looks like it's worth checking out due to the map changes alone. While you're at it, why not check out everything we know so far about Season 8.